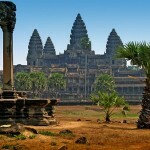 Use the form below to contact tour Joining Ho Chi Minh city tour 5 days directly. Ho Chi Minh City has appeal whether it be its museums, the Saigon River or Chinatown’s markets, pagodas. The nightlife is also varied, whether you seek a cultured evening or a walk on the wild side. 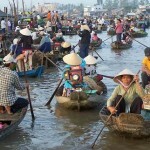 Enjoy a boat ride on the Mekong river and floating market. Paddle though palm lined canals on a long boat. Enjoy a lovely lunch in an orchard on Tortoise Island. Visit a family run business. Enjoy some free time to relax or discover the area. Upon arrival at Tan San Nhat Airport, you will be met and transferred to your hotel. Overnight at your proposed hotel in Ho Chi Minh city. Breakfast at the hotel. At 8.15am, tour of Chinatown to explore the Binh Tay (Cho Lon) and Thien Hau pagoda in the morning. We then visite the War Remnant museum. After break time for lunch, we will visit the Independence Palace – the residence of the president of South Vietnam until the end of the war in April 1975, and some beautiful French colonial structures including the Notre Dame Catheral and the Old Central Post Office, the City hall. We end the trip at Ben Thanh market where anything and everything is for sales. Breakfast at the hotel. At 8.15am – Drive west to Tay Ninh, the centre of Caodaism. O­n arrival we attend the fantastic mid-day temple service when the followers fill the hall wearing colored robes, a symbol of the curious combination of Confucianism, Taoism and Buddhism. O­n the way back, stop to visit the Cu Chi Tunnels, an underground network of tunnels constructed by Vietnamese fighters during the struggle for independence. The tunnels contained hospitals, accommodation, etc. and were used as a military base for the Vietcong during the American war. Drive back to HCMC around 6.00pm. Breakfast at the hotel. At 8:00 AM Depart for My Tho. Take a boat ride along the river, view the stilt houses and the fruit plantation along the river bank. 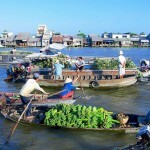 Visit the My Tho fishing village, floating fish farm. Proceed to Tortoise island and have lunch in the orchard. Enjoy a boat ride through Tan Thach natural canal in Ben Tre, cruising under the shadow of the water coconut trees. Visit a family business which epitomizes the idyllic rural lifestyle. Enjoy a rowing boat ride along the creeks, after trekking through the fruit plantation, village. Proceed to Can Tho. Transfer by motor boat to a small village in Cai Rang district. Check into your riverside cottage. 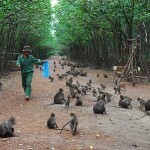 In the afternoon, go trekking around the village to experience the rural lifestyle of the Mekong Delta people. Join a family as they prepare dinner, then share the meal with them. After breakfast, take a leisurely boat trip to explore the picturesque tributaries of the Lower Mekong river (Bassac River), then proceed to visit Cai Rang floating market which are the liveliest in the whole religion. Have you ever tasted Vietnamese vermicelli soup? Well, now go and see how it is made. Then wander around the village and meet the friendly local people and experience how to cross a “Monkey bridge” which is built by only o­ne stem of bamboo. Transfer to the airport for your next destination.